Yesterday registration for The Pikes Peak Ascent and the Pikes Peak Marathon opened up. I saw so many out there on the interwebs mention they signed up. I, however, did not. Not yet, at least. This race is so special to me though. I was lucky enough to complete the race to the top of Pikes Peak with my Dad. We completed the Ascent in 2007. We didn’t know what we were doing, we were slow, and we were deliriously happy when it was all over. The Ascent proved to be a trek up a literal and metaphorical mountain for me and my Dad. It’s a treasured memory I will store in my heart for the rest of my life. I mean, how many of you have climbed a mountain with your Dad? The complete, heart felt account is found at this link. Warning: it still makes me cry after all these years. It’s all worth it once you’re at the top! As I listened to some great runner’s chat while we ran this winter, we got in to a conversation about a book they’d all been reading. 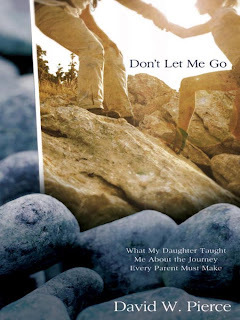 The book is titled Don’t Let Me Go, by David W. Pierce (What My Daughter Taught Me About the Journey Every Parent Must Make). My friends kept talking about how the story made them want to climb mountains and run races with their daughters, as the book accounts the adventures of a father and daughter as they climb mountains and, you guessed it, run races together. The more I listened the more I knew I had to get my hands on this book. I did just that. I was immediately surprised at the first two pictures I saw as I thumbed through it in the book store. They looked just like the pictures my Dad and I had taken as we journeyed up Pikes Peak. I gave the book to my Dad for Christmas and we both have really enjoyed comparing our climb verses theirs. I was so impressed with just the first two chapters, I emailed the author and let him know about me and my Dad. David Pierce has been such a great guy. He got back with me right away after he read my blog post. We’ve shared kind words and encouragements back and forth over the last month. It feels like we’re in the same club. We’ve both been changed by our “mountain climbs” and our “marathons.” We both know what an unbreakable bond a father and daughter can form once they endure these things together. If you haven’t climbed a mountain with your dad, I highly recommend it. Pikes Peak registration is open you know. Also, if you haven’t read David’s book. I highly recommend that as well. He was nice enough to send me 3 copies to give away. I’ll hold a random drawing in one week. To be entered in the drawing leave a comment. Let me know about what you thought of my story of our Pikes Peak Ascent. Let me know if you’ve experienced something similar with your Dad. Let me know what your hopeful plans are for you and your Dad. There’s no wrong answer here. I’m so excited for a few of you to get your hands on this book. Hey Lacy! I'd love to be entered in your contest to win a copy of Don't Let Me Go. I'm looking at it from the side of a Dad who would love to enjoy many of the times you speak of with my daughters as they grow up! I just read your "We Peaked" post and it is wonderful! It sound like an awesome (super challenging) experience and your Dad seems like a great one! I do have a couple of questions for you. How many days in advance did you arrive? Did it help you to acclimate? When I read 30 minute mile I started getting more nervous about the Wild West Relay I'm doing in Colorado in August. My father has always been my biggest running fan. He was my high school cross country coach and he saves up his change and that's my "marathon fund" that I use to cover registration fees and travel costs. While we rarely run together because we run 2 different paces(he used to be much faster than me and the marathon and half marathon is the only distances I hold the "family PR" at, although he recently had a partial knee replacement so I am currently faster) running is something that has bonded us together. I will become a mother in a few weeks, and I only hope I can have running or something else just as special to share with my future child. Oh my goodness – what a sweet story! I love that you and your Dad did it together. I just sent the link to your blog to my Dad, and I told him to hurry up and sign up for the Ascent with me, if he wants. (He sent me a message a few days ago letting me know that he was thinking of starting to run again.) Also, Pikes Peak is a fun memory with regards to my Dad, as he took us there when I was younger, and I remember him telling me about the marathon – that people run up Pikes Peak (and back down!). I didn't know why anyone would do that, nor did I have any clue what exactly a marathon was. I'm keeping my fingers crossed that he'll say yes. If not this year, another. The book looks awesome! And thanks for getting me even more excited for my first Ascent! So cool, Lacy. I'm really interested to check out that book…I am actually a runner in part from watching my own father run the Marine Corps Marathon several times during the 1980's. It looked fun, and was something that I told myself I would do as a grown up. And, well…my first marathon was the 2008 Marine Corps Marathon. One of my good friends did the ascent this year…it was a true spiritual experience for him, and this is a guy who has raced a lot and lived a lot of life. Very cool of you to share your story about your dad, and great that you got to do that together. Lacy . . such an awesome recount of the climb with your father. Growing up in the mountains of Western Montana, i climbed many mountains with my father while hunting . . . he was a mountain goat, I thought, as I could never see anything but the back of him. Today, he is the proudest a father could be of his son "who took on this crazy running thing". I had no idea he would be so proud of his "marathon runnin son". I am the father of a 13 yr old daughter, whom is beginning to enjoy, and be very good at running. We have run 2mi races together, and we both long for our first big race together. I hope that in coming years, that Bailey and I will climb the mountain together, as you did with your dad. My Pikes registration is confirmed for this year .. i'm so nervous! I would love to read the book, whether I win, buy, or borrow it. Lacy, I doubt I ever mentioned to you I have a daughter myself named Lacey, but she's only 2.5 years old, so who knows if she will ever want to hike up a mountain. Anyway, read your post from your 2007 ascent. Very good writing, but I think subliminally, it's telling me I have to go to the bathroom I actually registered for this year's PP Ascent, I had been putting it off for a couple years, so no more procrastinating. I will probably come back and read your recap again since it has some good detail in it. Put me in the drawing for the book please. What local races are you doing this spring? Hope to see you at a few of them. My 11 year old daughter is always looking for a challenge. She has gone running with me a few times. I would love to climb Pikes Peak with her someday and I know with her spirit she would be up for the challenge. Please enter me in your drawing.